Most people would take a few days off if a gunman stormed into their shop and fired a bullet into the ceiling - but not Bharati Gandhi. The owner of Devyish Superette in Kilbirnie, Wellington fought off an armed robber with a broom, and was back at work the very next day. The robber entered the store on Friday afternoon, demanding money. He fired a bullet into the roof of the shop, before fleeing with about $100 cash about 1.20pm. She was unscathed after the incident, and told the Herald she was up for another shift behind the till. "I'm all right to stay," she said. She was able to smack the robber over the head with a broom before he made off with about $100 cash, she said. "If I stayed here behind the till, he will kill me. So I just let him take the money." Her daughter Divya was also in the shop when the robbery occurred. It was a late start at the shop for Bharati the next day as she was unable to sleep for much of the night. "Last night I didn't sleep. I woke up at 11 o'clock in the night, and at 1 o'clock and at half-past 3. "I was still a little bit scared that he might come in again." 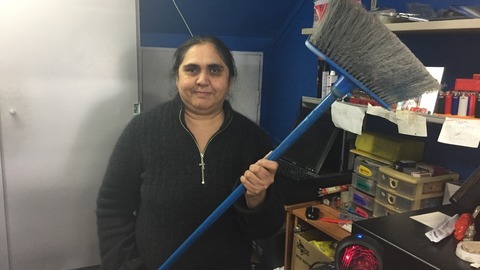 Gandhi said she has been praised for her courageous broom-wielding efforts. "So many people have said 'Good idea'." A police spokeswoman said "inquiries were still ongoing" into the incident. Detective Senior Sergeant Warwick McKee said a man entered the superette and threatened the woman with a handgun. "The offender pointed a firearm at a female shop employee and demanded money from her, and fired a shot towards the ceiling," he said. As he was running off with the cash, the woman hit the offender over the head with a broom handle. "The offender may have an injury to his head or require medical attention," McKee said. The man was last seen running across Kilbirnie Park, between the Kilbirnie Aquatic Centre and the Poneke Rugby Clubrooms, about 1.25pm. "Police would like to hear from any person who may have witnessed this incident or knows the identity of the offender." Police are providing support to the woman. "The unlawful use of firearms, particularly of a threatening nature, is of serious concern to police," McKee said. "It is important that anyone with any information on the identity of this offender speaks to police." The offender is described as a Caucasian man in his mid-20s, about 1.7m tall and of slender build. He was wearing black trousers and a long-sleeved black sweatshirt under a sleeveless orange high-vis vest. Any witnesses or people with information should contact Wellington police on 04 381 2000 or Crimestoppers, anonymously, on 0800 555 111.